Before I begin, it is important we take a deep thought at the words of the late literally icon Chinua Achebe, which read "....true leaders are not those intoxicated with their Oxford, Cambridge or Harvard degrees but those who speak the language of the people". One may wonder why I began with this. It is to briefly remind us what it takes to be a true leader. It is obvious that politicians who call themselves leaders in Biafra land, have been a great disappointment to the people. Just like Chinua Achebe mentioned intoxication. Here, they are not intoxicated with degrees but with insatiable quest for wealth, political favour; they do not speak the language of the people, but for themselves and that of the Hausa-Fulani Nigerian government in a bid to please themselves and their Nigerian paymasters. The disastrous consequences of their actions and inactions have subjected the masses to undeserved pains and sorrow. They pretend to be for the interest of the Biafrans yet they oppose and speak against them. 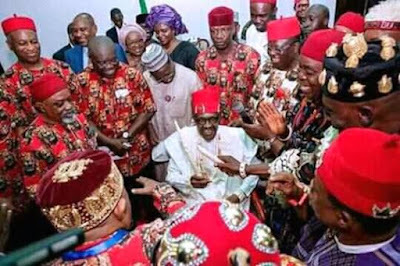 For political, monetary and selfish interest, they collaborate with Hausa-Fulani -led Nigerian government to subjugate, dehumanize and kill Biafrans. These are group of people who derive joy in killing the Indigenous People of Biafra whom they see as threats to their gluttonous Nigerian political ambition. Non among them has stood to fight for justice and speak the language of the people. These are those who (for monetary and political favour) takes instruction from State House Abuja, to utter words and stand against the general interests of the people. They are those who, after quietly watching the Nigerian military slaughter unarmed youths in Biafra land for the sake of the agitation for Biafra freedom ; engineered the proscription of IPOB where five million Biafrans were tagged "terrorists". Same people they claim to speak for and represent. Isn't that amazing? The big mistake the society and media make is quoting or taking the words and actions of these politicians to be that of Biafrans. The fact is that they do not in any way represent nor speak on behalf of Biafrans. Whatever they do is for themselves alone, not the masses because of the disconnection between the people and these selfish representatives a long time. In and outside Biafra land, there are vital proofs which indicate that they do not represent Biafrans any more. Biafrans now rely on Nnamdi Kanu and the leadership of IPOB alone because that is the only voice they trust. When salt looses its taste, it is thrown away because it has no value anymore. That is exactly what has happened to the now self-acclaimed leaders of Biafra land, starting from Ohaneze Ndi Igbo, the governors and others because the immense atrocities, evil and pains they have caused Biafrans is immeasurable. Anyone still listening to them or parading them as representatives or voice of the people, is doing that at his or her own risk. Their interests , demand and quest is far different from that of the masses. Theirs is Nigerian political ambition and political contracts from the federal government , while that of the masses in Biafra land is justice, equity and freedom. Biafrans no longer have interest in the politics of Nigeria and will adopt every option available to make their demand come to fruition. Hence, the boycott of elections organized by the Nigerian government starting with the November 18th Anambra gubernatorial election. All Biafrans demand, is Biafra freedom. Editor : Comr. Ogbuanya Chikezie N.